China Rare Earth Magnet Limited supply magnetic assembly & tools like quality super permanent magnetic lifter which apply to factory, harbor, workshop, warehouse installation of electricity, oilfield, etc. 2. Better workmanship brings excellent quality. 1. Magnetic circuit of lifting magnets is based on computer simulation, which enabled reasonable magnetic field distribution and great depth of magnetism penetration. 2. Permanent magnetic separators are more simplified than the electromagnetic separators for not requiring excitation power and cooling system. 3. Are energy saving with lower failure rate. 4. Have the advantages of simple handle, safe and reliable operation. 1, Surface of object shall be cleaned first if there is rust and convex. The center line of lifter shall be parallel with the center line of object. Place the lifter on the operating floor or table, and rotate the handle from the "-" to the "+" position until it reached limit pin. Check if handle security block is automatically locked, and then start lifting. 2 Overloading of object is strictly prohibited. Never allow human body to walk under the object being lifted. 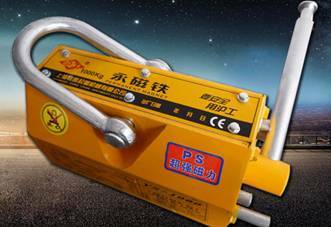 Temperature of work piece itself and the operating temperature shall be less than 80 degree, without severe vibration and shock. 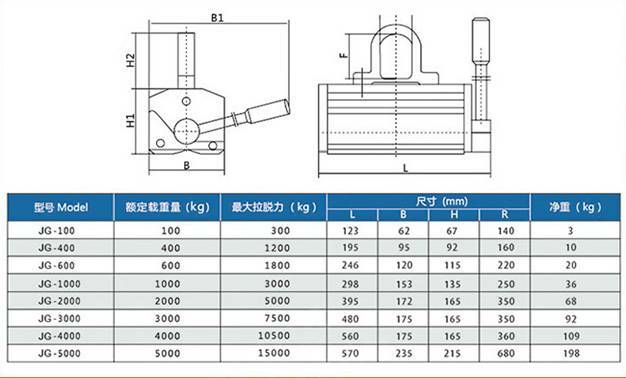 3 For cylindrical objects, the contact angle of the B shaped groove and the object will be 2 lines, so its lifting weight is only 30%-50% of the rated load. 4 When the lifting is finished, rotate the handle button inward and separate the security bottom from security pin. When the handle is rotated from "+" to "-" and the limit pin, the lifter will be in a closed state, and separate from the work piece. 5. The shape, weight and thickness of work piece are all closely related to the performance of permanent magnetic suckers. For example, usually 500kg magnetic sucker can absorb 250kgs rod steel. The contact surface will not be enough for lifting 500kgs rob steel, or it might lead to lifting accident. Last, avoid lifting thin steel plate.